Advocacy tools from a trusted social business platform. Founded in 2010, Sprout Social is built on the idea that the world is better when businesses and customers communicate freely. Our solutions exist to help streamline and enhance conversations on social media—with customers, prospects and enthusiasts. Social media advocacy starts with Bambu. 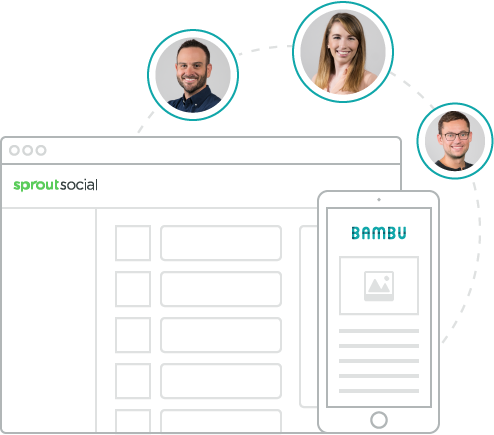 In 2015, we launched Bambu as a technology platform to improve employee advocacy. Utilizing digital and social content to become a thought leader, talent recruiter or even a salesperson, employees can now act on behalf of your organization more effectively than ever. We understand that the people who spend time and energy committed to your brand or organization are the people most directly invested in helping it succeed. Our people make it possible. Sprout’s solutions don’t build themselves—we have dedicated teams that are relentless about developing superior software and solving difficult problems for our customers. Team Sprout boasts a unique combination of people with their own traits and outside interests. Powered by the folks at Sprout Social. From our headquarters in Chicago, we create software that helps more than 24,000 leading brands get closer to their customers. Let your team try Bambu today!